Is Master loot better for your team? A typical Mythic team that isn’t doing split runs and is trying to gear up a team at the same time (everyone starts around an equal level of gear, as opposed to alts trying to catch up), won’t see much of a difference between the two loot systems. That’s because as a team is progressing, Master loot doesn’t provide much of an advantage over Personal loot. Even if a few items get ‘wasted’ because they go to a trial who leaves or a TF item goes to someone who already had that non-TF item… the impact on the team as a whole will be small enough that you won’t feel it. Loot funneling efforts would make the boss would die mere seconds sooner. (Of course, split raiding will be greatly impacted). Will I fall really far behind if I get unlucky with Personal loot? As the infographic shows, if you fall 3 upgrades behind other players on your team, that would result in about a 2.5% DPS loss compared to them. Of course, 2.5% is definitely greater than 0… but I argue that it would barely be noticeable in-game. 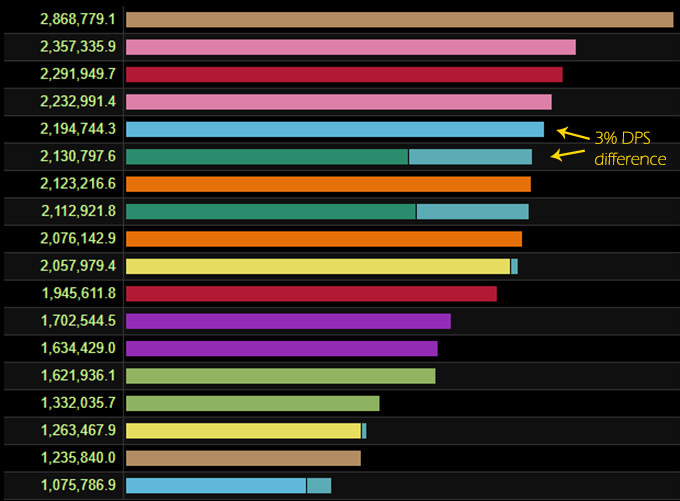 To put this in perspective, here’s a screenshot of what a 2.5% DPS difference looks like on Warcraft Logs (or a damage meter). Gear isn’t the only thing that you can get lucky (or unlucky) with. Your trinket procs, crits, and how things time up are all subject to randomness. This randomness ends up with about 10% swings in damage, even when you execute your rotation perfectly. So that helps put this in perspective. A lot of assumptions were made to calculate the loot-chance section of the infographic. Blizzard hasn’t ever made the exact loot drop chances public for either system. So some assumptions have to be made. Here is the full list of those assumptions. On Master loot: the boss drops 1 item for every 5 people. On Personal loot: you have a 20% chance to win an item. I assume no trades are happening. The boss has 20 items it could drop and you can equip 5 of them. We ran a survey in December, 2017, that asked about all sorts of things from people’s teams, to their personal rankings on Warcraft Logs. It also happened to ask about loot systems, which became very relevant with this Master Loot change for BfA – I was able to have survey data from before the change was announced. After looking at the data, and seeing how little impact it actually has on team progression (outside of split raids), we like the change. We’re not claiming Personal loot is categorically better, but we are saying that it won’t dramatically affect team progression.